A lazy law school grad adopts a kid to impress his girlfriend, but everything doesn’t go as planned and he becomes the unlikely foster father. BEFORE: Now that I’ve caught up to where I’m supposed to be in the marathon again, I’ll be taking it easy for the next couple days as Thanksgiving break approaches. Instead of having to skip a few days, I’ll be taking it easy and watch some shorter ~90 minute films starting with today’s Big Daddy. This is actually the third Adam Sandler comedy in the marathon (the first two being Anger Management and Punch-Drunk Love) but I still haven’t seen many of his “classic” comedies (like Billy Madison and Happy Gilmore). Big Daddy will knock one off that list. AFTER: Going into Big Daddy I wasn’t sure what to expect and I certainly wasn’t expecting to like it as much as I did. I haven’t laughed harder or more consistently at a film since probably Seven Psychopaths back in early October. Looking at Big Daddy from afar things don’t look so great. It follows a standard romantic comedy template (with a focus more on relationships in general - with the kid - rather than romance) and a lot of the humor relies on physical harm and stupid actions rather than witty dialogue. But sometimes plain and simple is just what you need to be funny. The simplicity of the story and the humor along with the characters was just a winning combination that had me laughing for much of the film. Something that has come up in my post-watch research is the accolades Big Daddy was nominated for an won. While I thoroughly enjoyed the film, many people did not and it was nominated for five Razzie Awards (which honor the worst in film) with Adam Sandler winning Worst Actor. I think this is a good time to bring up a discussion about personal taste. As with all of the films I watch, my reviews are solely my opinion based on my tastes and preferences. There are films I hate that others love and some I love that others hate. In the case of Big Daddy I happened to enjoy the type of humor they used and thought it worked very well. That doesn’t mean I consider it Oscar worthy or even deserving of best-of-the-year lists; it’s not. In Roger Ebert’s review of the film much of his criticism revolves around the absurdity of Sonny Koufax’s (Adam Sandler) parenting techniques and the situations in which he and the child, Julian (Dylan and Cole Sprouse), are placed. I agree with Ebert in that the situation is absurd and if this were reality would be appalled at what is going on. But for this particular film, I chose to overlook problems in plot and production quality and chose to focus on being entertained. 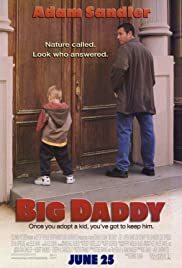 For me, Big Daddy was extremely funny and entertaining but take that with a grain of salt as you decide for yourself whether you want to watch the film or not.